This sign is part of a new initiative aimed at combating sexual harassment in restaurants. If you work in a restaurant, you might soon be seeing a sign posted in your place of employment that shows its zero tolerance for harassment. The sign is the most visible part of a new initiative aiming to combat sexual harassment in restaurants from online reservations company OpenTable. The “Open Kitchen” campaign, as they’re calling it, will combine a public service announcement with the signage, and ask restaurateurs to sign a pledge to provide a safe and equitable work environment for women, LGBTQ individuals and minorities. “When you look for organic, locally grown, you should be able to look for, who’s running this kitchen? Is this an open kitchen? What restaurant are you walking into? What values do you hold?” OpenTable CEO Christa Quarles said when she debuted the campaign at a talk she led at the South by Southwest conference. Branding restaurants as Open Kitchens will give diners a way to support restaurants that treat their employees well – and potentially avoid those that don’t. In a speech titled “Silicon Valley to Restaurants: The Path to Equality,” Quarles discussed OpenTable’s efforts to hire more women, and how restaurants can do the same. Quarles said OpenTable also would be taking steps to elevate the profile of women in the industry and would release a list of top female chefs and restaurateurs. Lists of female chefs have proved controversial at times because they position female chefs as a separate class within the industry – though discomfort with these lists usually comes from the fact that they are published side-by-side with all-male lists. Restaurant ranker “World’s 50 Best,” for example, has a “best female chef” award, which Eater editor Amanda Kludt called “insulting,” writing that women “are neither a different species nor a different category of human.” A representative says the list will be published in the fall. In the PSA, famous chefs, including Mary Sue Milliken and Edward Lee, pledge their Open Kitchen bona fides. The pledge poster, Quarles said, was an idea that came from posters seen in many restaurants that offer instructions on how to help someone who is choking. Quarles thought that signage could be effective for providing a different kind of help instead – especially when posted in back-of-the-house areas, where female restaurant employees are most in danger. A November report by The Washington Post found that many sexual assaults in restaurants occur in isolated areas of the kitchen, such as storage closets and walk-in refrigerators. 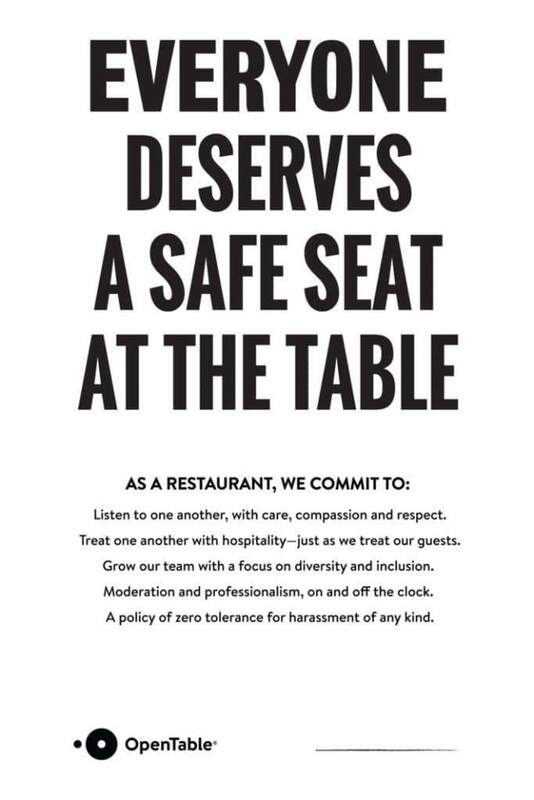 OpenTable’s campaign is one of the first broad responses to the restaurant industry’s reckoning with its sexual harassment problems. Journalists have shone a spotlight on the bad behavior of chefs John Besh and Mario Batali, among others. But because the restaurant industry is composed of hundreds of thousands of independent small businesses, there hasn’t been a hierarchical force to impose standards and training upon individual restaurants, many of which don’t have a human resources department. OpenTable, which is utilized by more than 45,000 restaurants, has the potential to become such a force. But it’s worth noting that the company has not cut ties with bad actors – Besh and Batali’s restaurants utilize the service. Eleven restaurants in Durango are currently listed by OpenTable’s service. Restaurateurs can sign up to become a part of the campaign on OpenTable’s website. OpenTable is presenting an April 11 webinar on preventing sexual harassment. Durango Herald Food Editor Nick Gonzales contributed to this report.